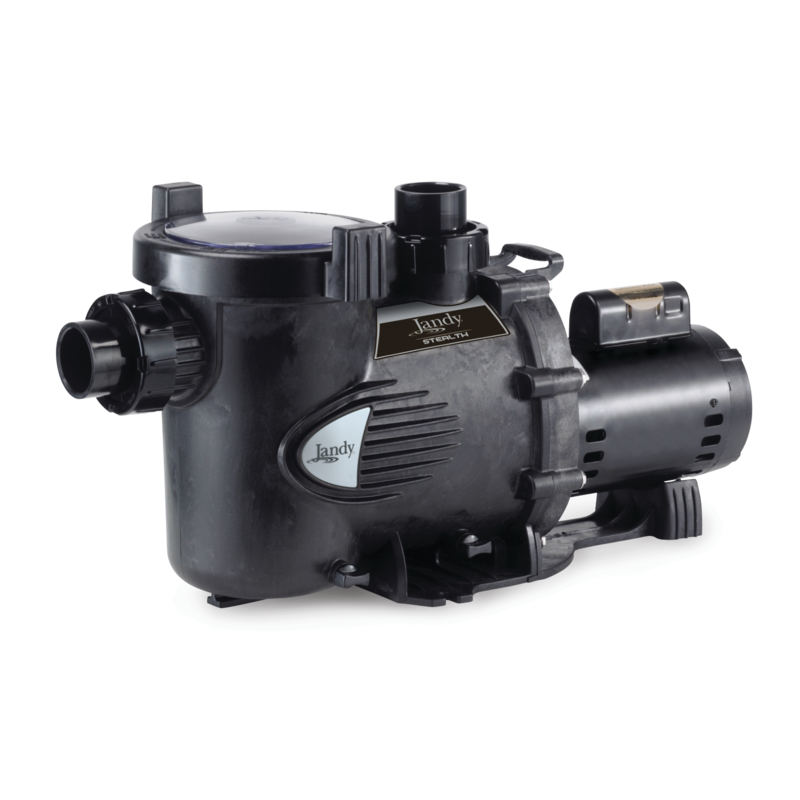 The Stealth is a professional-grade pump that combines superior performance with energy-saving efficiency and “Quiet Technology,” making it the most efficient single- and two-speed pump available. The Stealth is easy to install, and contains the largest trap basket on the market for easy routine maintenance. SHPF3.0CND 3.0 208–230 15.0–13.6 2.5"-3.0" 62 lbs 33"
SHPM1.0CND 1.0 208–230/115 6.0–5.6/11.2 2"-2.5" 43 lbs 31"
SHPM1.5CND 1.5 208–230/115 7.8–7.4/14.8 2"-2.5" 45 lbs 32.25"
SHPM2.0CND 2.0 208–230 9.6–8.8 2"-2.5" 50 lbs 32"
SHPM2.5CND 2.5 208–230 11.0–10.0 2"-2.5" 57 lbs 33"
Air leaks are still present. 1 Check the suction side piping union. While the pump is running, try to tighten the union. If this does not stop the air leak, turn off the pump. Loosen both unions and slide the pump out of the way. Remove, clean and re-install both union o-rings. 2. Reposition the pump next to the piping and secure the union nuts to the pump. With clean union o-rings, hand tightening of the unions should create a seal. If the unions still do not seal, gently tighten with a large pair of tongue and groove pliers. DO NOT OVER-TIGHTEN. Bubbles present in the pump basket. 1. Air in system. Check the pool or spa water level to ensure it is at the proper level and that air is not being drawn into the suction plumbing. 2. If the water is at normal level, turn off the pump. Remove the lid and check for debris around the lid o-ring seat, as this will cause air leaks in the system. 3. Clean the lid o-ring and put the lid back in place. 4. Hand tighten the lid to make an air tight seal. 5. Do not use any tools to tighten the lid. Turn the pump back on. The cleaning/circulating system is not operating correctly. 1. Verify that the skimmer baskets, pump basket and other screens are clean. Clean as necessary. 2. Check filter and clean as necessary. 3. Check valve positions. Adjust as necessary. Note: Multiple pieces of equipment operating at one time (for example, waterfalls, spa jets, and surface returns) will affect the cleaning system and may prevent it from working properly. 4. Check the cleaning system manual to ensure that the system is adjusted according to the manufacturer's recommendations. The pump gets hot and shuts off periodically. 1. Ensure that there is adequate room around the motor to circulate air and keep the motor cool. 2. Have a qualified electrician check for loose connections and check the voltage at the pump motor while it is in operation. The voltage must be within 10% of the motors data plate rating. If the voltage is not within 10%, contact a qualified electrician and/or the local power service provider. The pump is leaking water between the motor and pump body. This is caused by a damaged or failed mechanical seal. Replace the seal. See the "Mechanical Seal Replacement" portion of the manual. There is no air in the system, but the pressure is still low. 1. It is possible that debris is caught in the impeller. The pump impeller moves the water, and the vanes in the impeller can become blocked with debris. See the "Blocked Impeller" portion of your manual for more information. There is no debris blocking the impeller and the pressure is still low. 1. The pump impeller and diffuser are showing signs of normal wear. Have a qualified service technician check the impeller and diffuser and replace as necessary. 2. If the pump is part of a relatively new instalaltion, it could be an electrical problem. Contact a qualified service technician. Have the technician check for loose electrical connections and check the voltage at the pump motor while in operation. The voltage must be within 10% of the motor's data plate rating. If the vltage is not within 10%, contact a qualified electrician and/or the local power service provider. 3. Pump seal is leaking air. Have a qualified service technician replace the seal.